Skip the store-bought, sugar-laced, milk chocolate Easter eggs. 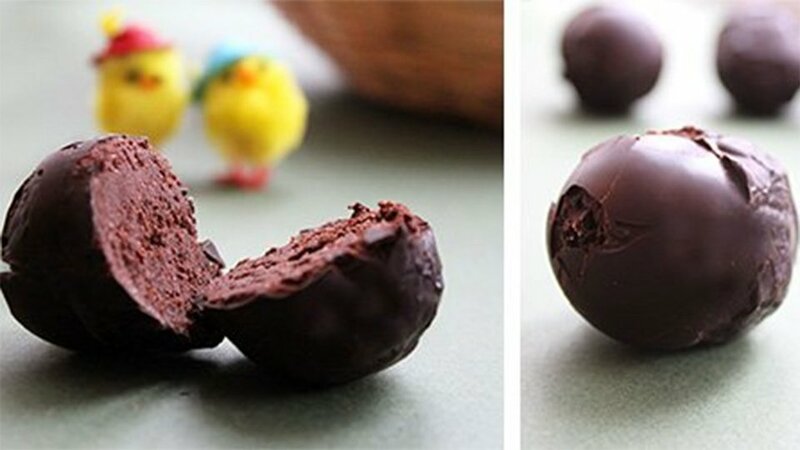 Get in the kitchen and make these delicious, protein-packed, dark chocolate eggs instead! In a bowl, mix the protein powder, cocoa, coconut flour and milk until a thick paste, kind of like a dough, is formed. You need to roll the dough into "eggs," so if your mix is too runny or sticky, add a touch more coconut flour until it gets to the right consistency. (Be careful! Too much coconut flour will make the filling too fibrous.) Note: If you don't have coconut flour, you can use casein instead. Form six "eggs" out of the batter by rolling them with your hands, and proceed to melt your dark chocolate in a bain marie, or a glass bowl on top of a pot of boiling water. When the chocolate has melted, dip your "eggs" to create a chocolate shell, and then place the chocolate-coated eggs on a baking tray lined with baking paper or foil. Put them in the freezer for an hour or so. That's it! Your eggs are ready to eat.